Has your water bill been higher than normal lately? Have you been distracted by the sound of water running even when you are not operating sinks, showers, or toilets? These are signs that may indicate you have a slab leak or a leak at another location in your home or building. Irvine Plumbing and Rooter Pros can help. We work with certified, independent plumbing contractors in the area that are the best in the industry. 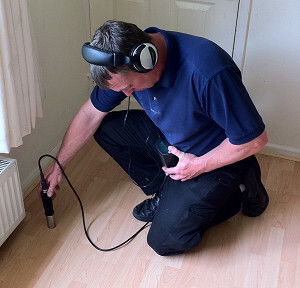 Using a number of different electronic leak detection methods, our contractors have the equipment and the knowledge to quickly determine where the source of the problem lies and how to remedy it for as little cost and mess as necessary. Electronic leak detection uses state-of-the-art technology to find below ground leaks as well as leaks within your walls without using destructive exploratory digging practices. Many customers call us with concerns about slab leaks and immediately assume the service will cost a fortune. This is because these individuals are only aware of the old search and find methods of detecting leaks. Our contractors use electronic leak detection exclusively, so you won’t have to go through the headache and financial hassle that other detection services create. How Can Leaks Be Prevented? The plumbing system in your home or place of business is designed to last for a long time, but sometimes weaknesses occur that make it possible for leaks to develop. Sometimes the situation is unavoidable, but there are steps you can take to reduce your chances of repairs. To begin with it is crucial that any plumbing installed is completed by a qualified contractor this includes water heater installations. Amateur installations carry a greater risk of failure. Also, having your plumbing serviced regularly is another way to ensure that everything is working as it should and catching minor problems before they escalate. To learn more about plumbing leaks and detection services, give us a call today. We offer a number of ways to save on services and back-up all of our services with a 100% lifetime guarantee. When you do business with us, you’ll quickly discover why we are the preferred service for leak detection in Irvine, California.